The Triceraton that teleported aboard the aircar holds a gun to Horridus’ head and orders Don to surrender. Donatello complies and is then knocked out of the vehicle by the angry alien. As Don falls, he uses the armor’s ability to morph jet engines to save himself – but he doesn’t know how to synthesize jet fuel, so he continues his freefall! Fortunately, Don-san is able to morph a helicopter prop that saves him from another deadly fall. Onboard the vehicle, the Triceraton refers to Horridus as “little sister” (since she is also of saurian blood – a species that the warrior recognizes), and the easily influenced hero becomes infatuated with the giant. Back at the museum, Donatello and Horridus discover the dead body of the warrior. Horridus gets angry with Don for killing him. Donatello explains that he did what had to be done and then ponders on what they can do about the alien corpse… as he’s thinking, two more Triceraton warriors teleport in and open fire. Casey takes a cab home and the driver gives the vigilante a free fare for being the one to kill the sewer monsters. Jones heads to the Turtles’ lair to tell them about it, and as he opens the door, he spots Master Splinter sitting atop Pimiko (who is bound by the telephone chord). Splinter asks Casey to make tea and the three sit at the kitchen table. Jones taunts Pimiko about capturing her komodo dragon allies and the kunoichi uses the distraction to toss the tea into Casey’s face, throw the kitchen table on top of Splinter and escape. Jones heads out to find her, just as Leonardo arrives. Leo tells them about the transmat that they helped Leatherhead and Dr. X complete, and how the Triceratons were porting through. Casey agrees to help Leonardo find reinforcements while Splinter states that he needs rest, as he’s already over extended himself. At the history museum, Donatello tries to devise an escape plan when Horridus stands up to greet her “brothers”. The Triceratons open fire and hit the rash reptilian, which enrages Don, who attacks. Raphael has now amassed sixty new recruits to his Foot army, but he muses how he’s had to take on criminal activity to fund the project – thus making his Foot Clan no better than the original Shredder’s. Leonardo arrives and is attacked by the neophytes. Leo easily dispatches them and Raphael orders his men to stand down, which confuses his lieutenants because they were given orders to keep Leonardo out. Leo explains that he came to get the Foot’s help against the Triceratons, but he’s angry that Raph’s Foot are already commiting crimes for cash and prepares to storm out. Raphael stops him and pledges that his Clan will help the Turtles fight the alien menace. 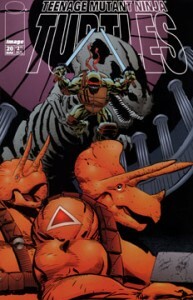 Leatherhead, Dr. X, Casey Jones and Michaelangelo are spying on the Triceratons in LH’s lair. The aliens begin teleporting more of their warriors through and our heroes decide that they can’t wait for Leo and his reinforcements any longer – it’s time to fight!